The Bundesministerium für Ernährung und Landwirtschaft has produced the 2016 annual statistics for Germany. These statistics seem to show some big changes from previous years and we will attempt to break down the comparisons according to the different methodologies used. Germany produces two sets of data as part of the Animal Protection Act. 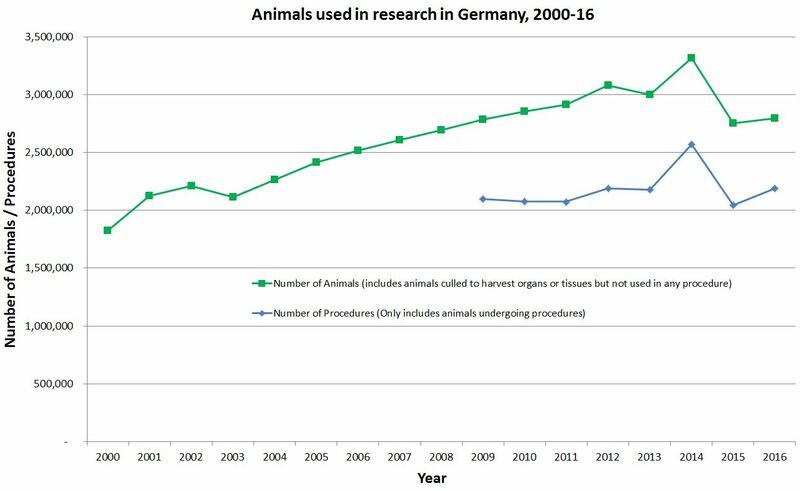 Historically, Germany has used data from animals used under both §7(2) and §4(3) of the Animal Protection Act to create a dataset of animals used in research. This dataset was broken down by varying categories including use, severity, genetic status and more. This year, while the old totals can be seen separately, the main datasets are numbers of procedure on animals excluding animals killed for tissues or organs (under §4(3)). This newer methodology puts Germany in line with the EU requirements for reporting animals in research – allowing for easier comparisons between countries. 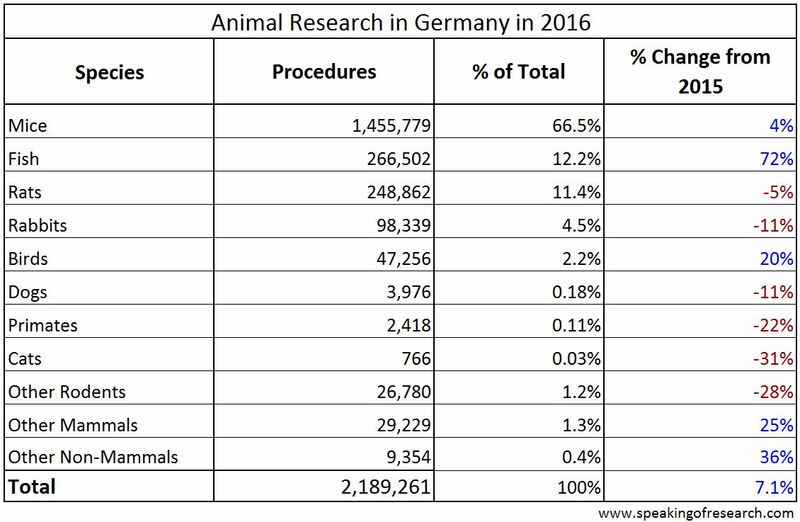 In 2016, Germany reported 2,189,261 procedures on animals, up 7.1% from 2015. The actual number of animals is slightly lower at 2,131,448 (due to some animals being used in more than one procedure during 2016). There was a large rise in the use of fish (+72%) and birds (+20%), while rabbit use dropped (-11%). There was a drop in the use of dogs (-11%), cats (-31%) and primates (-22%), which together accounted for less than 0.4% of all procedures. The number of animals used, including those used for harvesting tissues and organs (but not used in any procedure), rose 1.6% to 2,796,773 animals. This rise was smaller than the rise in procedures was because the number of animals used for harvesting tissues/organs dropped 12% from 754,997 (2015) to 665,325 (2016). This may reflect that efforts to share tissues/organs and ensure maximum use of any single animal killed for this purpose have been more effective, alternatively, it may reflect a slight shift from ex vivo preparations to studies in live animals. The different proportions of species compared with the previous table are because mice are disproportionally used for harvesting tissues/organs, while cats were not used at all for this purpose, dogs only used once, and primates only 44 times. Overall animal research has risen over the past two decades, peaking in 2014. Unsurprisingly, the number of procedures tracks the numbers of animals very closely, with the difference between the two numbers reflecting the animals killed for harvesting tissues and organs. Where the two lines converge, the number of animals killed for tissue/organs has fallen, and where they diverge, the numbers killed for this purpose have risen. The rest of our analysis will use the Number of Procedures. This is not because the number is smaller, but because it reflects the new style of statistics, and allows better comparisons with other EU countries (Germany is unusual in counting animals harvested for tissues / organs). 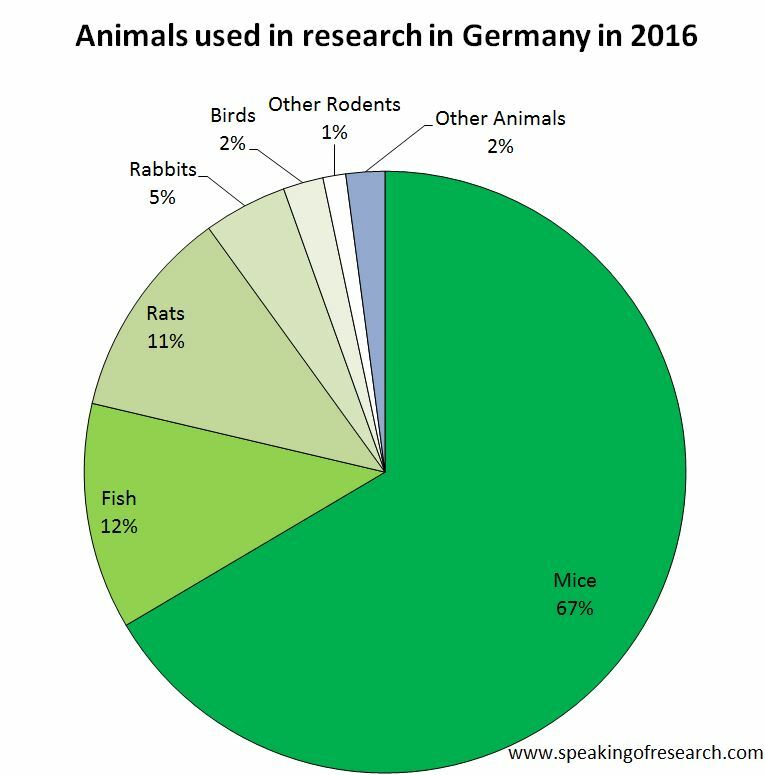 Mice, fish and rats together accounted for around 90% of all animal procedures in Germany in 2016. Germany remains one of the few European countries where rabbits are the fourth most commonly used species in 2016. Dogs, cats and primates accounted for only 0.32% of all animals. In previous years, Germany conducted its retrospective assessment and reporting on severity using numbers of animals. This year, in line with EU reporting requirements, they report the number of procedures. This means comparisons to 2015 are meaningless as a large chunk of “non-recovery” procedures (all those where animals are killed for harvesting tissues without any procedure prior) are removed. Overall 71.7% were Non-recovery or Mild, 23.1% were Moderate and 5.2% were Severe. Posted on February 6, 2018 February 7, 2018 by EditorPosted in News, StatisticsTagged german animal research, Statistics, Tierversuche. Previous Previous post: Research Roundup: Cancer vaccine tested in mice goes to clinical trials, e-cigarette smoke found to damage DNA and more. Next Next post: Research Roundup: A link between food and breast cancer found, the role of the small intestine in processing sugars and more!